Are you thinking of travelling abroad to get married? Your wedding dress is one of the most significant and symbolic purchases you will make in your lifetime, so it deserves to be looked after and you are probably worried about how you will get it to your wedding destination safely. Don’t worry, our boxes have travelled all around the world and back again. They are a perfect size to meet most airline baggage size restrictions and can be carried onto a plane as hand luggage. At ©️Bonbods we are passionate about giving our customers a choice, and have the largest choice of designs/colours available in the marketplace. Our feedback and product reviews are “open” on all our shops so you can see exactly which product has been purchased. 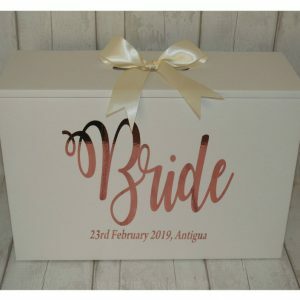 “Stand out from the crowd” with our stunning designs and colours, personalised with your own details, every box is unique. If you can’t see a design you like we can design one for you. The boxes are delivered ready assembled with a strong carry handle, 2 metres of ribbon, 20 sheets of acid free tissue paper and packing instructions.  We also supply a tiara/shoe bag, Mr & Mrs or Mrs & Mrs luggage tags with certain designs. 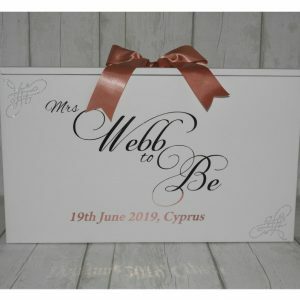 Our Wedding Dress Travel Boxes are made of the highest quality Ph Neutral and Acid Free card in the UK by our partner company who have 32 years experience in the packaging industry . They contain NO recycled brown card which may damage your beautiful dress. 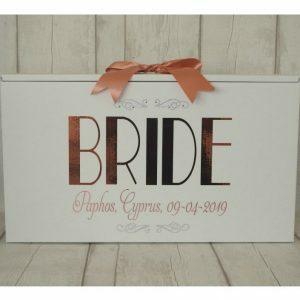 We even cater for your Bridesmaids, Flower girls, Mother of the Bride/Groom etc having THREE sizes of boxes available. You can choose from the standard size 55 x 36 x 20 cms or a smaller box which is 40 x 30 x 19 cms or a large XXL Storage box which is 82 x 52 x 18 cms. THESE BOXES ARE SUITABLE TO CARRY AS HAND LUGGAGE ON MOST AIRLINES FLIGHTS AROUND THE WORLD. 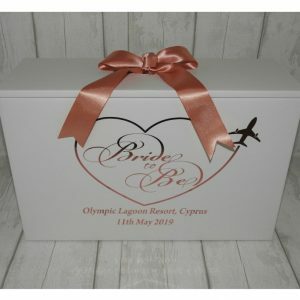 Transporting your wedding dress/gown on a plane is made effortless with one of our wedding dress travel boxes. So if you are travelling abroad by plane or boat your wedding dress will arrive safely for your big day . 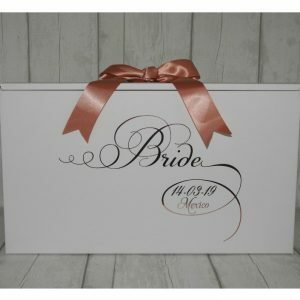 We also ship our Wedding Dress Travel boxes worldwide.